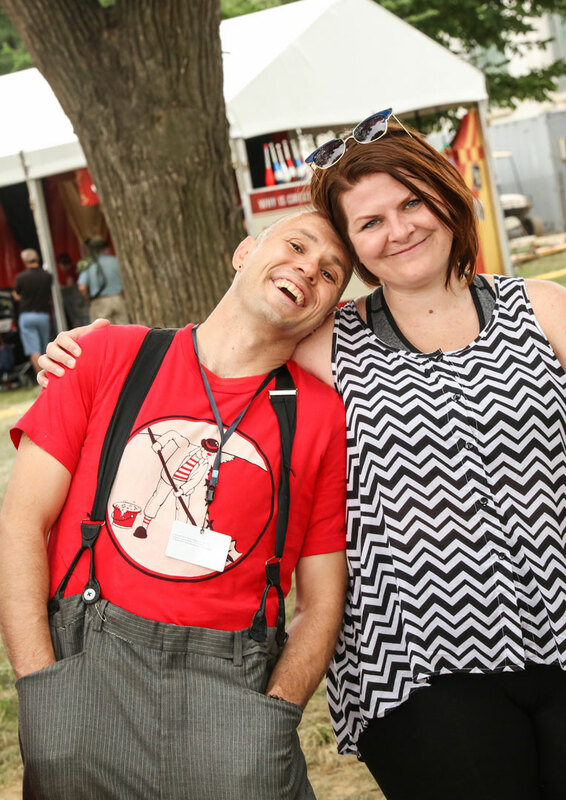 The first week of July, Clowns Without Borders participated in the Smithsonian Folklife Festival. 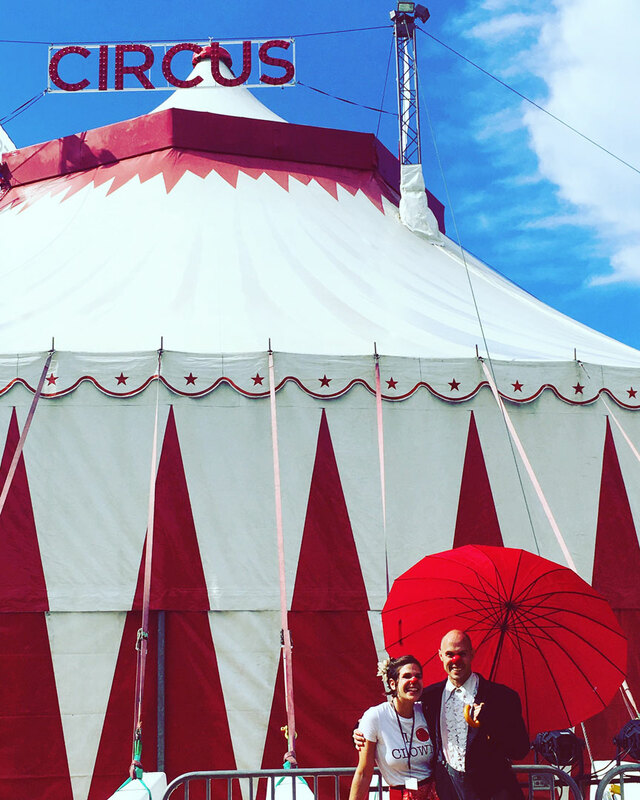 It was the 50th anniversary of the festival, and this year’s theme was Circus Arts. The National Mall was transformed. For a week, the iconic view of the Washington Monument included a circus tent, trapeze rig, and hundreds of circus artists. 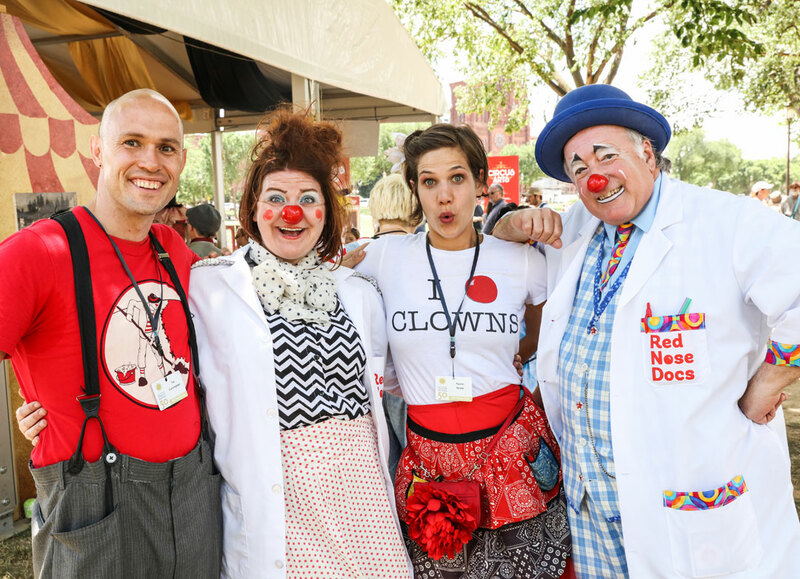 We were joined by Kolleen Kintz, a Board Member and volunteer artist, who was presenting on behalf of Healthy Humor, where she is a hospital clown. Kolleen and her husband Bobby are the dynamic duo behind PhotosbyKintz. The captured beautiful photos of the festival, that we wanted to share. As you’ll notice, many of the games we played and the acts we performed are the same as those we play on international projects. The experience was truly a celebration of the universality of laughter. 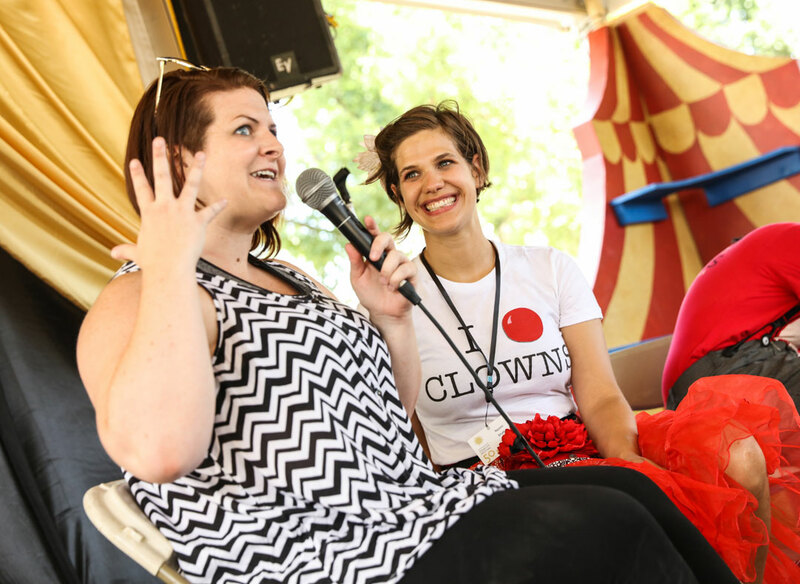 Tim and I had a full day scheduled of speaking on panels, performing, and presenting about Clowns Without Borders. We were scheduled to perform in the pre-show for the Big Top show. As clowns who spend most of our time working in offices (I mean, performing in non-traditional theater spaces), we were both a little jittery about being in the ring. In between our other commitments, we found pockets of time to rehearse. An hour before our call time for the big show, we received news that due to unexpected flooding backstage the show was cancelled. Unsure what to do with our extra time, we wandered to the Big Top. We stood lingered in front of the tent, deflated. Exhausted parents and disappointed kiddos mingled aimlessly, not quite ready to give up their place in line, or to make a new plan. A little girl who had seen our last performance, popped up next to Tim, and started to play. We turned it into an act (Tim wanted to play, I wanted to go home). Before we knew it, the crowd had formed a ring around us. Tim gave me a look that said: Do you want to do this? I winked back. We started our show. In the mud of the National Mall, we performed some CWB’s classic acts. It felt very similar to our performances in the field: the audience gathered in a circle without stage lighting or audio equipment. We led them in song and ended with a dance party. 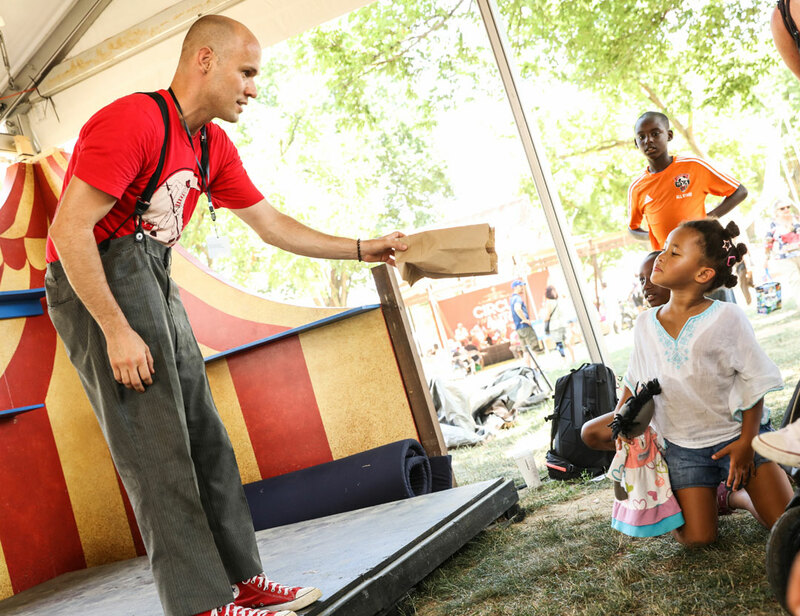 It seems fitting that our big top debut was replaced with a street performance. By the end of the show, we were both filthy, but happy. We had done what we do best. We took a worst-case-scenario (in this case, the show being cancelled), and turned it into a moment of shared laughter. 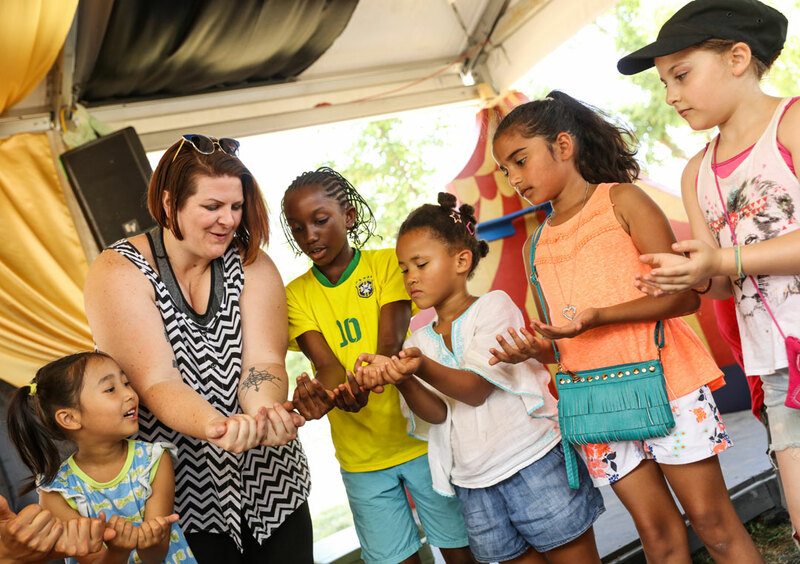 I am so humbled to have experience the childlike awe of watching the glittery big top acts on Friday night, and so grateful to be reminded that my true joy and true self is in the mud, encouraging small moments of laughter and being upstaged by tenacious seven year olds! Next Post: Why is there a kid on a bucket?